I love the tubular cast-on. It makes a garment look really finished and professional. 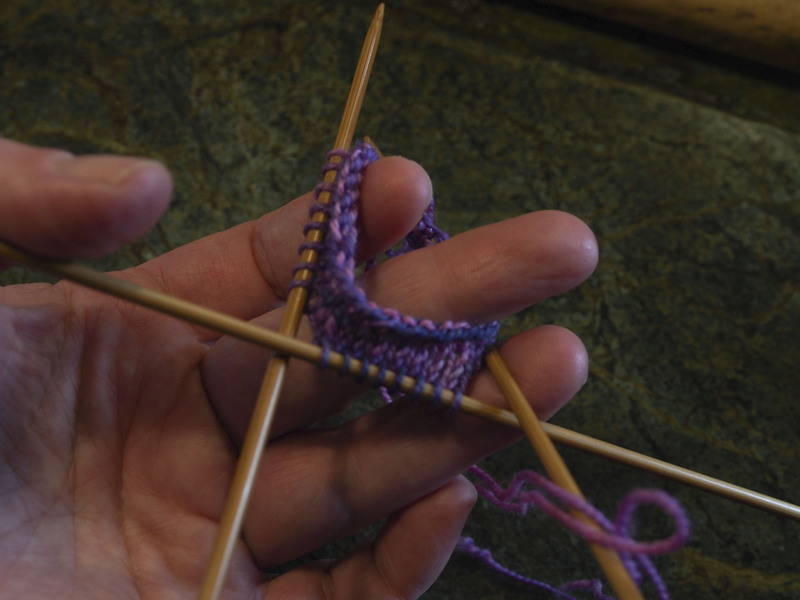 Years ago, when I saw a sweater knit with the tubular cast-on, I asked the owner how to do it. She was teaching at the LYS, and I had taken many classes from her. Her response was that I needed to just take that class. I taught myself instead. 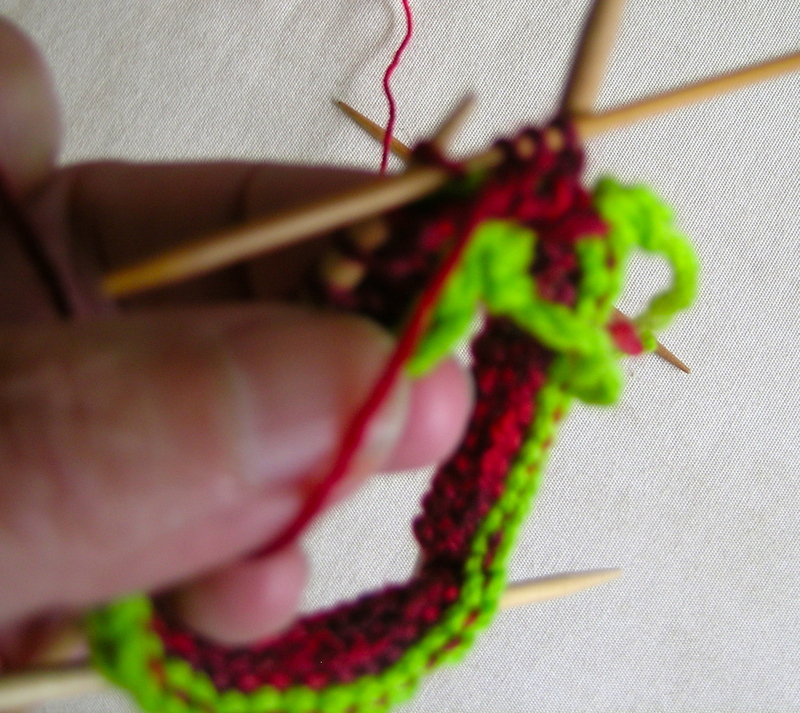 Well, I don’t teach knitting, and feel that the more we share the better. 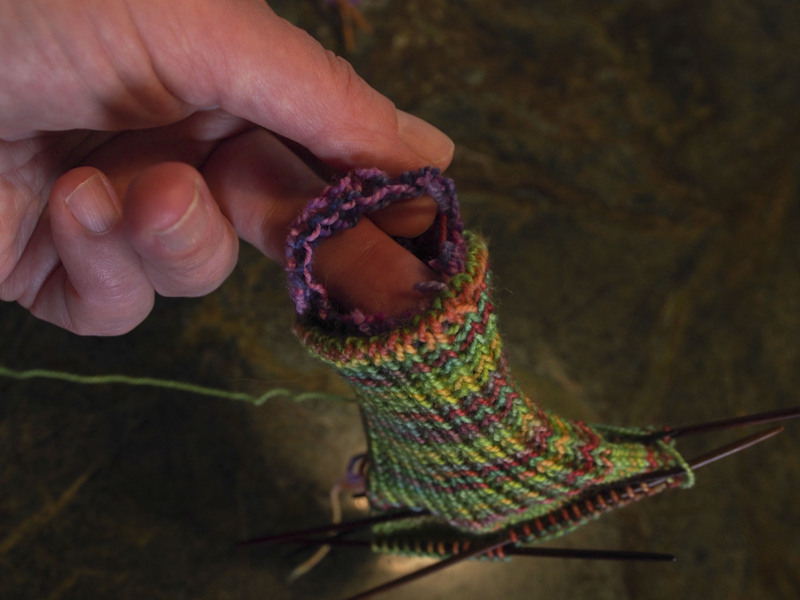 So, here is my version of a tubular cast-on for socks. This works for a 1×1 rib. If you wanted to convert to a 2×2 rib, that is possible, I have done it on sweaters, but that is for a different post. 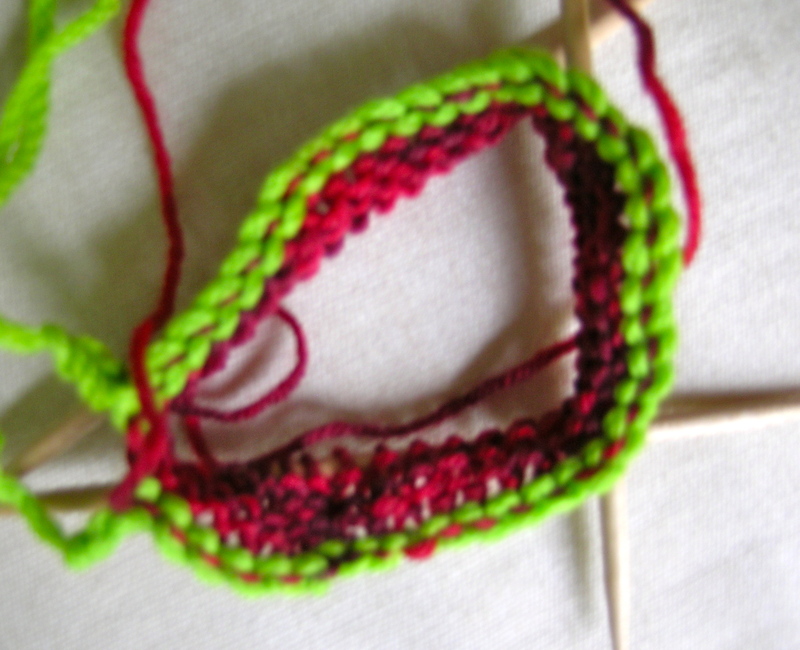 Do a provisional cast on using a crocheted chain in a different color of yarn, and preferably something like cotton that will pull out easily, and a fairly loose chain (i.e. larger crochet hook). Chain a few more stitches than 1/2 of the desired finished number. For example, here I want to end up with 80 stitches, so I did a chain of 45+ sts. Next pick up one stitch in end of the purl bumps on the reverse side of the chain. 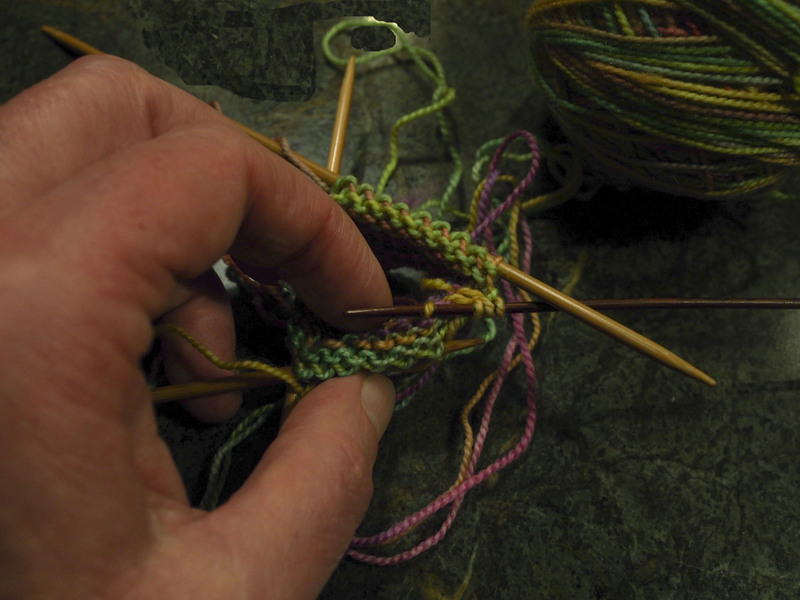 I start a couple of stitches in from the end of the chain (hence the additional chain stitches). 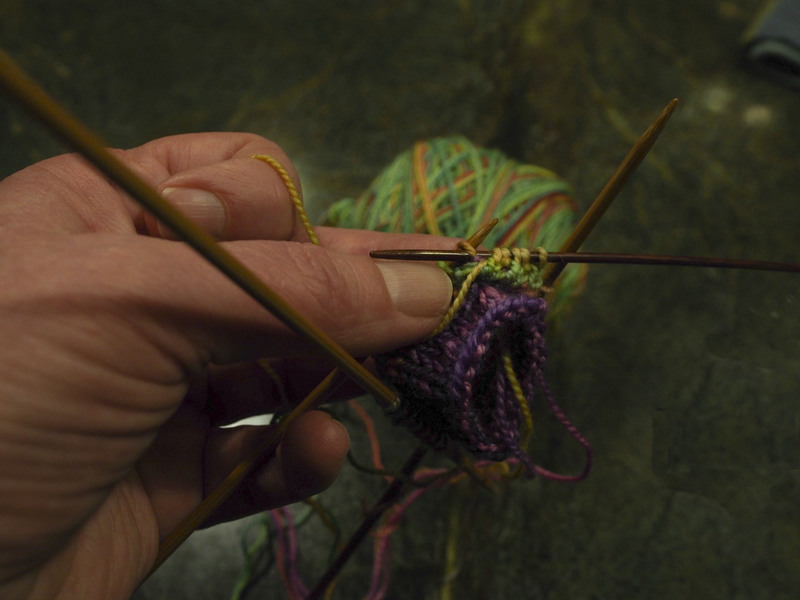 Use a needle 2-3 sizes larger than what you will knit your socks with. I used a size 4 needle here. 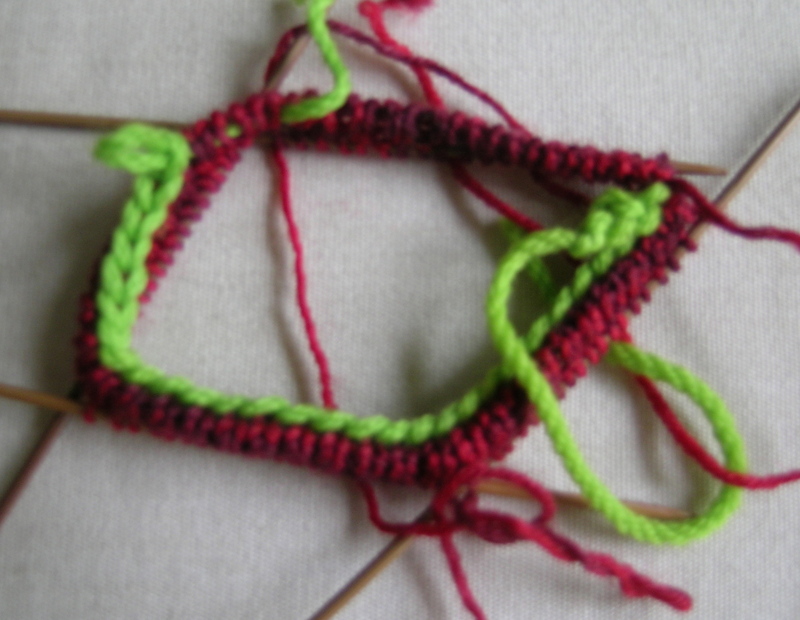 Pick up 1/2 the number of finished stitches desired + 1. 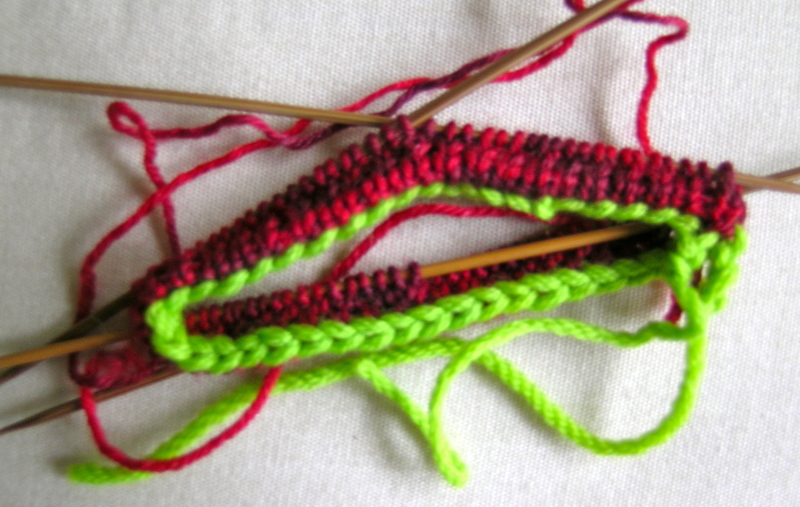 I wanted to end up with 80 sts for my socks, so I picked up 40 + 1 =41 sts. 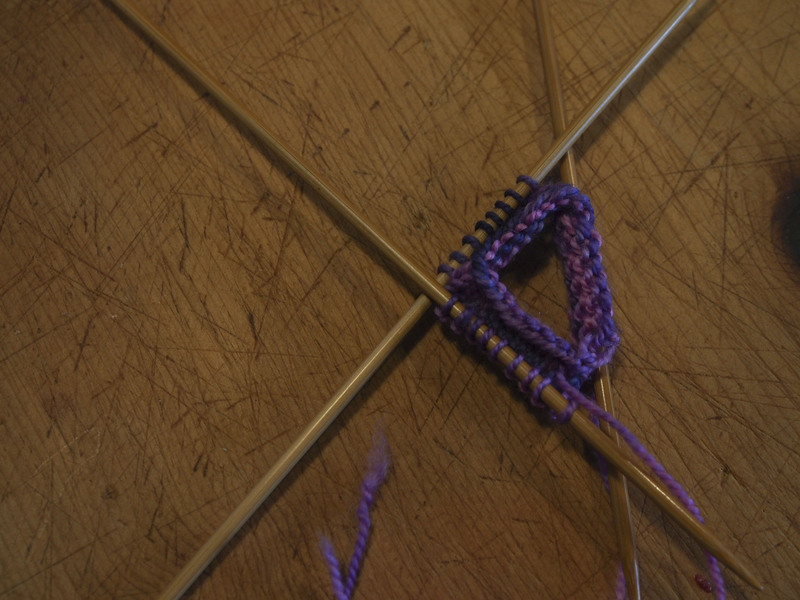 Join in a circle (with the forever mentioned note: be careful not to twist your stitches), and knit 3-4 rows. 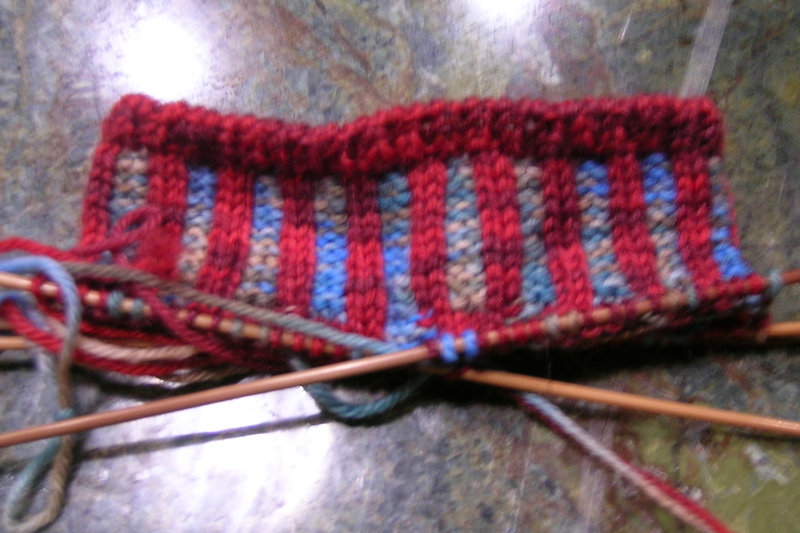 Do 2-3 rows of 1×1 ribbing. On the first row knit the first and last stitch together. 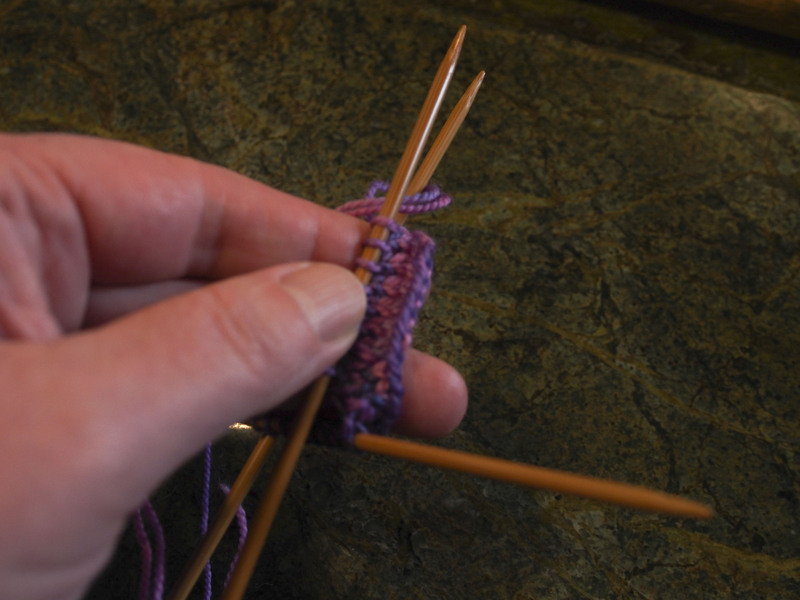 The stitch count will now match your pattern requirements. Go back and unzip the crochet chain, and you will have a beautifully stretchy edge that looks like it rolls over on itself. 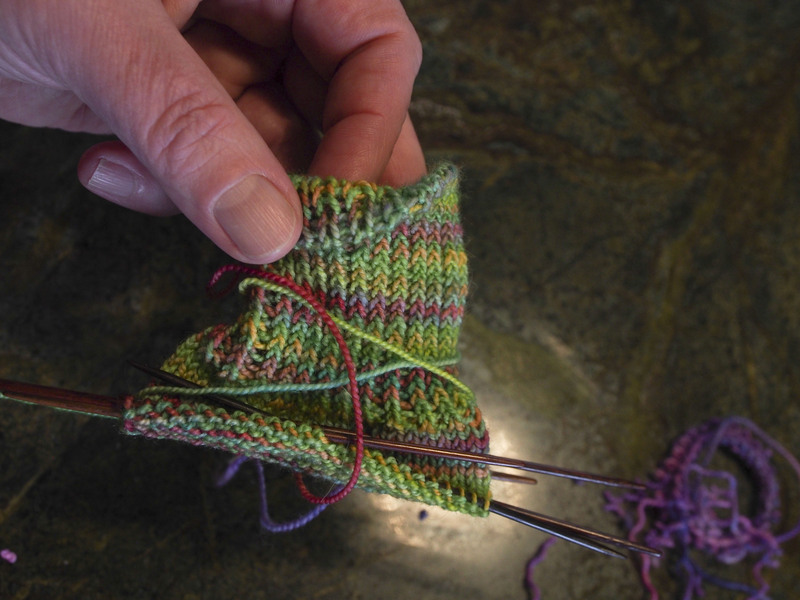 I am using this technique to start the Janel Laidman Granada socks that I am making. 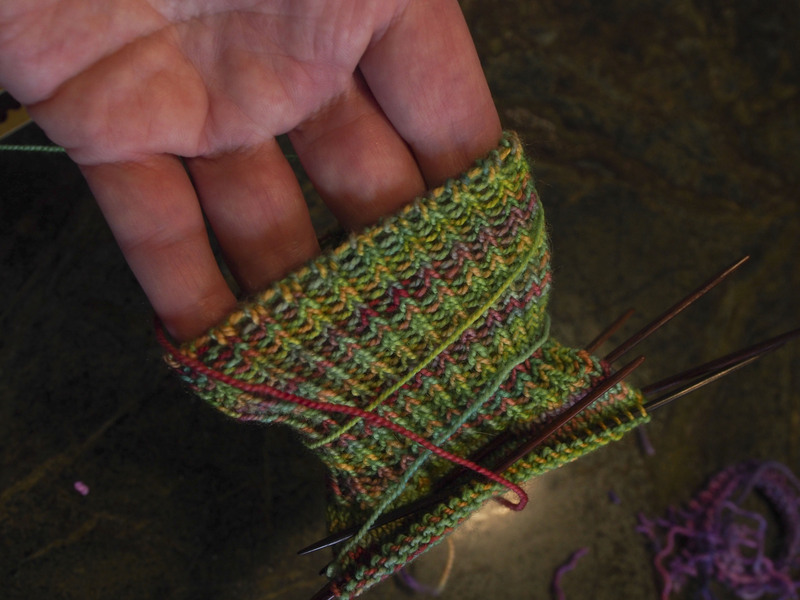 These are a high sock, and I wanted a good stretchy edge to help them stay up. And here is the bounty from yesterday’s canning session. 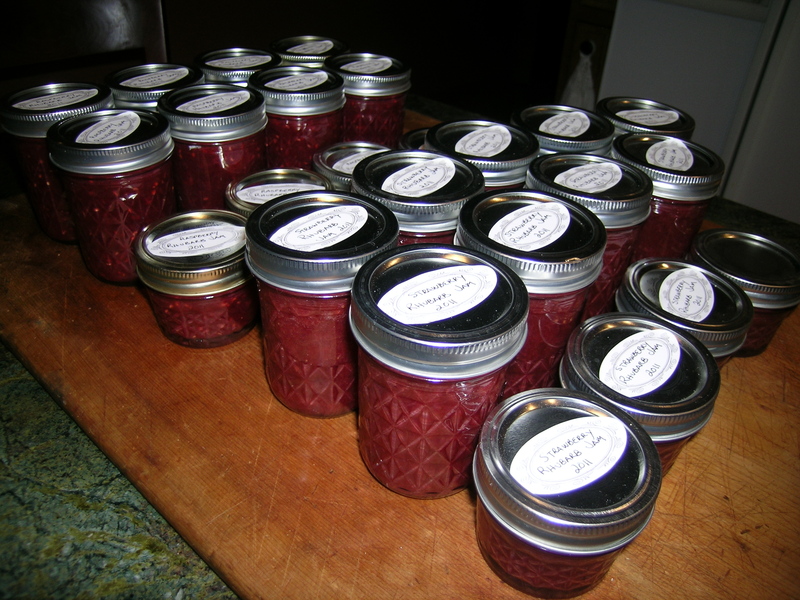 I made Strawberry-Rhubarb jam (used to be my favorite ever), and Raspberry-Rhubarb jam (my new all-time favorite). I did not want to use Pectin, but tried oranges and lemons instead. It is not as firm as I would like, but oh so tasty. Next is a multi-berry jam, and I think that I will use Pectin this time. Thank you for the tubular cast on instructions. I have been wanting to try it, and now I can. 😉 …. and.. strawberry rhubarb is my favourite jam. raspberry rhubarb? I will have to try that sometime. Thanks for the feedback. Let me know if you have any issues with the tubular cast-on, and I will try to “talk you through it”. Definitely, Raspberry-Rhubarb jam rocks!